Common and widespread throughout most low- and mid-elevation habitats, apparently shunning only dense forest. Does not breed in subalpine parkland (Smith et al. 1997), although BBA records in King and Kittitas Counties extend across Cascade crest where below tree line. Found in farmlands, meadows, open forests, wetlands, industrial zones, and low-density residential areas. 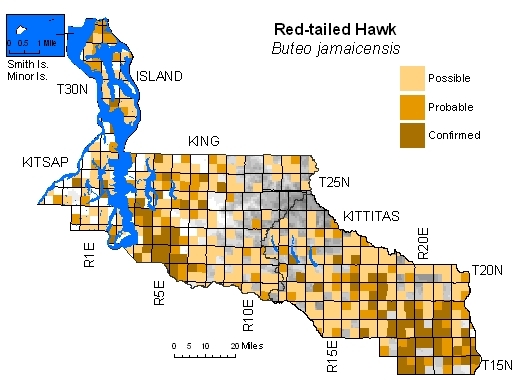 Nests along I-5 corridor south of Seattle but absent north to county line, possibly due to higher crow densities there. 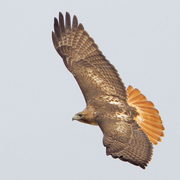 Most residents light-morph, but rufous- and dark-morph birds occur in small numbers.